Overland | Me fail? I fly! This is Jeff Sparrow’s last Overland after seven years as editor. It’s a solid farewell performance at the end of an impressive tour, with the usual heady mix of politics, literary chat, fiction and poetry. This issue has a lot of short fiction – the winners of two short story competitions (the Overland Victoria University Short Story Prize and the Story Wine Prize) plus the runners-up of one of them (here and here), and the final piece in the Fancy Cuts series. All four prize-related stories are worth reading, especially Madelaine Lucas’s ‘Dog Story’, winner of the VU prize. In the Fancy Cuts, Ali Alizadeh’s takes on the brief of writing a story that somehow revisits one from a past Overland. He follows the same contours as his original, 1961’s ‘Taffy Was a Pacifist’ by James Aldridge, (which you can read here): an outsider immigrant child who is bullied exacts revenge with the help of an outsider adult, and in a brief coda becomes an admirable adult. Alizadeh’s title, Samira Was a Terrorist, signals the ways his work departs from the original. A girl rather than a boy, Samira exacts revenge that is much less socially acceptable than Taffy’s. The original’s moral ambiguity is deeply buried beneath a celebration of masculine virtues and skills, to surface only in the final paragraph, if at all; Alizadeh puts moral ambiguity front and centre in his much more violent, challenging and interesting tale. Bias Australian? by John McLaren chimes nicely with Fancy Cuts’ juxtaposition of old and new Overlands. A writer for the magazine since 1956, McLaren traces the development of its cultural nationalism from its beginnings in 1954, including the evolution away from the realist fiction endorsed (required?) by Communist Party policy. [T]he smiles are part of her work, a part that requires her to co–ordinate self and feeling so that the work seems to be effortless … part of the job is to disguise fatigue and irritation, for otherwise the labour would show in an unseemly way, and the product – passenger contentment – would be damaged. The other stand-out is A Tale of Two Settler Colonies by Michael Brull, which compares Australia and Israel as settler colonies, and poses a substantial counter to the common (anti-Semitic?) tendency to single Israel out as somehow worse than other similar nation-states, including our own. There are a couple of beautifully contrapuntal pieces on the writer’s life: The authentic writer self by Khalid Warsame (‘There is the fear that people will look at my name or my face and say, “Oh, right, another African writer who writes about Africa. How inspiring and nice.”‘) and Go, little book by Kirsten Tranter (‘Before The Legacy was even published it attracted attention because of my literary family background (my mother is a literary agent and my father is a poet). “If you were to put money on anyone getting published it would be Kirsten Tranter,” said one memorable notice, with the unspoken “no matter what she wrote” impossible to ignore.’). Unlabelled, green-tinted pages feature the ever-reliable columnists, especially Alison Croggon being intelligently reassuring about writer’s block, and Giovanni Tiso striking terror into our hearts about the end of the internet. No 218, which is already published and sitting beside my bed, has Jacinda Woodhead in the chair. A young Tamil man who has been seeking asylum in Australia heard that he had been definitively been denied refugee protection. and on Wednesday night he doused himself with petrol in Balmain and set himself alight. He’s in hospital now, very badly burnt. Sarah Whyte had the story in today’s Sydney Morning Herald. Minister Scott Morrison in partnership with the Sri Lankan High Commission have a focus ‘to ensure for the proper care and support of this young man’. And also the SMH cares, enough to carry it on page 9 of the hard copy edition. The immolations aren’t acts of terrorism, nor even of despairing disempowerment, even though it is clear that they emerge from decades of deep frustration. Their dramatic increase appears to demonstrate an absolute and unconditional commitment to freedom. All the existing written statements of the self-immolators make this clear. They are also a form of radical self-determination: no authority can take such sacrifices away from the community on whose behalf they were performed. They are what Oxford University sociologist Michael Biggs calls a legitimate part of the ‘global repertoire of contention’, a form of principled if morally painful action ‘intended to appeal to bystander publics or to exhort others to greater efforts on behalf of the cause’. ‘The immolations,’ he says later in the essay, ‘depend upon global real-time exposure for their influence to be felt; a purely domestic response remains all too vulnerable to internal silencing.’ The most obvious way to silence this young man, whose first name is Janarthanan, is to talk about it as a product of ‘mental illness’. No, it’s a statement about vicious cruelty in Sri Lanka and brutal indifference in Australia. This collection is quietly yet resolutely political, and leaves us considering our own strengths and vulnerabilities, and who we may imagine clinging to for guidance through tough decisions. I nearly forgot and perhaps I should have as it’s such a small book, but this is another title in my Australian Women Writers Challenge for 2013. The title of this issue of Southerly, ‘Islands and Archipelagos’, refers to its subject matter, but it could just as easily refer to its form: a literary magazine, archipelago-like, is a gathering of diverse entities, each with its own integrity but all having something in common, whether a theme as in this case or something less tangible, like a tone, or an ethos, or a presiding personality. crew of squatters, graziers, country postmasters, district magistrates, missionaries, and employees of the Overland Telegraph recording details of Indigenous Australian life and culture in the mid- and late- nineteenth century and the desks of Edward Tyler at Oxford, James George Frazer at Cambridge and Emile Durkheim in Paris, and, through them, and a number of other significant late-nineteenth-century anthropologists, to the likes of T. S. Eliot, Ezra Pound, Sigmund Freud (see, for example, the first half of Totem and Taboo), Marcel Mauss (Essay on the Gift) and so many other key figures in early twentieth-century thought and aesthetics that one wonders whether the Simpson Desert or the Trobriand Islands should be given a place – a quite significant place – amongst the generating landscapes of Modernism. Yes, that is just one sentence. The article not only delivers on the sentence’s promise but ends with a link to a provocatively titled companion piece, ‘Origins of Modernism in the Great Western Desert: An Introduction’. The Royal Visit. Easter Show. My sherbet packet. Liquorice stick. My shop-bought pie. My Iced Vo-Vo. My Cracker Night. My Jumping Jack. My father’s gas mask. Old blue tunic. My small sister in the clinic. My six-stitcher. My first duck. The choko vine. The dunny truck. Michael Jacklin’s ‘Islands of Multilingual Literature: Community Magazines and Australia’s Many Languages’, which prises open the subject of Australian literature in languages other than English. I’ve always felt odd about the portrayal of 1950s Australia as monocultural and monolingual: Italian and other southern European languages were part of the soundscape of my 1950s north Queensland childhood; one of my best friends in primary school was Chinese; my farmer father played poker with a Greek, a Korean and a Yugoslav; in the 30s and 40s my magistrate grandfather spoke to Italians who appeared before him in their own language. This essay discusses evidence, including a journal from Brisbane in the 1930s, that there has long been lively, linguistically diverse literature in the Australian context, much of it invisible to the mainstream literary establishment. As well as these pieces that topped my pops, there are learned essays on issues facing real islands and islanders, on Andrew McGahan, Randolph Stow, Drusilla Modjeska, and the rock band the Drones. There are short stories (especially Sandra Potter’s ‘“an empty ship in these latitudes is no joke”’, a lightly annotated list of things taken to and from Antarctica, and Terri Janke’s ‘Turtle Island’, a not-quite-ghost-story, not-quite-love-story, not-quite-war-story set in the Torres Strait in World War Two). There are other excellent poems and nearly 70 pages of reviews, plus the overflow in The Long Paddock, which includes a fine review by Sarah Holland-Batt of Ali Cobby Eckermann’s Ruby Moonlight. A final note: the spectacularly beautiful cover, reproduced above, is described on the contents page as Sue Kneebone’s Continental Drift, but it’s actually a detail from that work, which I recommend you have a look at on Sue Kneebone’s web site. What do you want to do when you grow up? Create? If you combine ‘Entertainer’ with ‘Artist/creative professional’ you get 26%. What’s that? 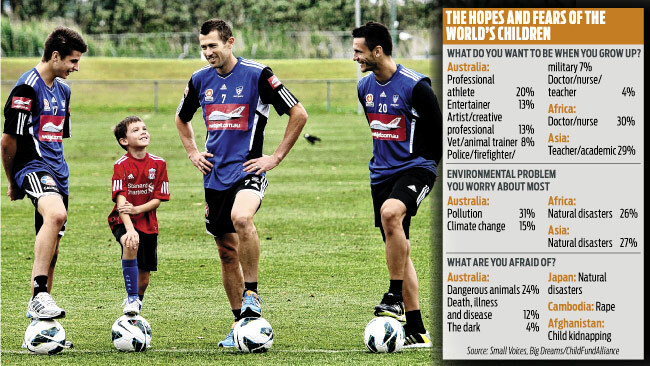 More Australian children want a career in entertainment and the arts than in sport. But that doesn’t fit the media narrative, so let’s bury it. 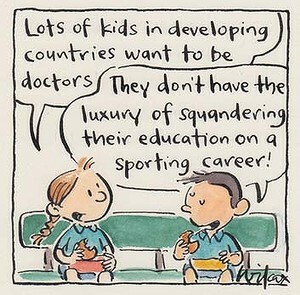 Has it occurred to anyone else that our governments are willing to back young people’s sporting aspirations with millions of dollars, but leave their artistic aspirations unresourced so that for most of them it remains an unrealistic dream? It’s not just that winning gold at the Olympics is seen by the press and politicians as more important and newsworthy than making things ‘with which the soul of any witnessing human being can resonate and conceivably find comfort, catharsis, awakening, provocation, solidarity, beauty and, perhaps, enlightenment,’ as Clare Strahan put it recently on the Overland blog. Young people’s desires to do the latter must also be trivialised and marginalised. The current precipitate withdrawal of funding from fine arts education in TAFE is symptomatic. So is the Sydney Morning Herald‘s almost total silence about the cuts. can look like meaning when you’re ten. The headlines mock you: Sport! again! Oh child! child! We’ve corrupted thee! wants to make, give, create art.